No doubts to the quality and performance of kitchen appliances designed by Farberware, it makes impressive quality microwave ovens that have advanced features. If you are looking to buy a high quality and performative grill microwave oven, please check Farberware FMO12AHTBSG 1.2 Cu. Ft. 1100-Watt Grill Microwave Oven as well. 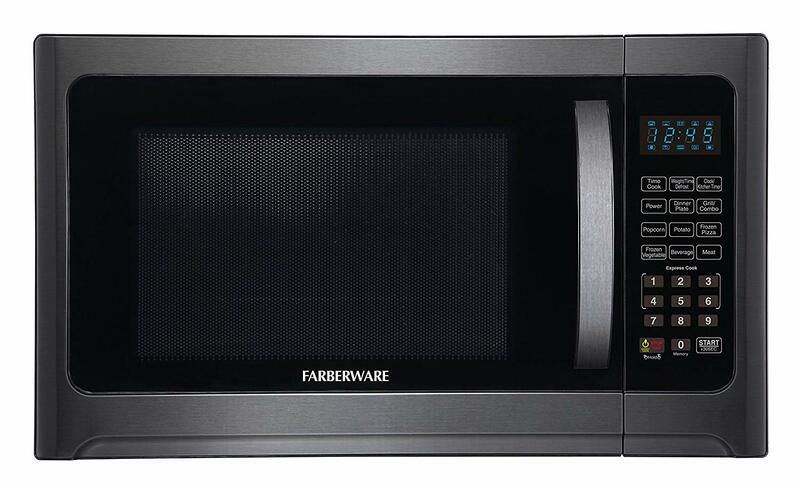 The Farberware grill microwave oven is available in many interior sizes such as 1.1 cu. ft., 1.2 cu. ft., 1.3 cu. ft., and 1.6 cu. ft. You can choose a Farberware microwave oven based on the interior size you require. Farberware FMO12AHTBSG comes with 1.2 cu. ft. cooking space and 1100 watts of cooking power. The 1.2 cubic feet cooking capacity is perfect to fit on your kitchen counter. Further, it has 10 power levels so that you can adjust power settings from ten-percent to hundred-percent based on your cooking requirements. Further, the Farberware grill microwave oven has special cooking functionality, which are grill and microwave giving you the unlimited cooking possibilities. When we talk of the look of this Farberware microwave oven, it has premium black stainless steel design that can greatly minimize fingerprints and smudges. Measurements: 13.7 inches wide, 12.8 inches high and 20.5 inches long. Also, the Farberware microwave oven comes with interior LED light so that you can watch your food as it cooks and it has memory function for customized settings.